Habitat NoVa Youth! : We Love our Volunteers! Youth groups volunteer at our ReStores fairly often, but recently we had a very special group of volunteers. 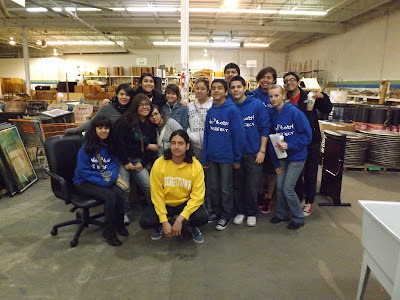 These volunteers were a part of the Youth Leadership Program and came all the way from Illinois. Illinois! These teens spent a week in and around the DC area and volunteered with a different organization each day. What an inspirational way to spend their spring break! We were lucky enough to have them as volunteers at our Alexandria ReStore and they helped organize the store while brightening everyone's day! The Youth Leadership Program, part of Youth Crossroads, Inc., helps develop and enhance leadership skills that youth already possess. The program includes internships and trainings that help youth design, plan and implement their own service projects. Check out their website to learn more about this awesome program! Thanks for your service, YLP! Come back anytime! Participate in Habitat's Mother's Day Contest!